Congratulations, Heidi Grange (@geolibrarian)! You are the winner of #1 Welcome to the Tribe from our new Tib & Tumtum series from Graphic Universe. Please send us a DM on Twitter or an email to publicityinfo@lernerbooks.com with the subject line “Free Book Friday” and tell us your mailing addresses so we can get your book in the mail. This week we’re going for the gross factor by giving away a copy of Ick! Yuck! Ew! 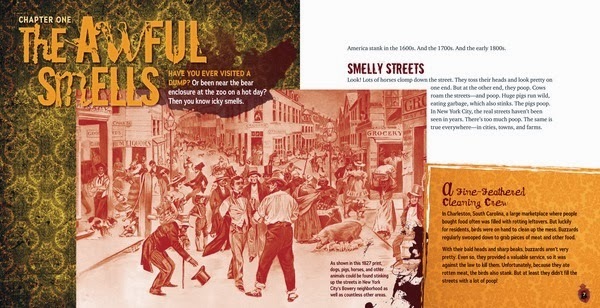 Our Gross American History from Millbrook Press. In history class, you’ve studied people who lived long ago. But do you know just how gross daily life was in the United States around the time of the American Revolution? • They didn’t wash most of their clothes regularly. • Their teeth were rotting. • Bedbugs feasted on people as they slept. • Lice crawled through their hair (and their wigs) day and night. Ready to step out for a breath of fresh air? Well, look out, because the streets were filled with poop. Don’t believe it? Hop in a time machine and travel back to June 1770 in the pages of this book! We’ll announce the winner during Free Book Friday on December 13, so be sure to come back to the Lerner blog to see if you’ve won!